The recipe below is a translation of something my roommate found online, along with some adjustments from trial and error. First, boil the pig skin in a pot of water as a cleansing step. Drain. Put first 8 ingredients into a large pot and bring to a boil. Reduce heat to a small boil/simmer. Cook for 90-120 minutes or until pig skin has softened. Remove pig skin from pot. Cut pig skin into very small pieces and return to put. Heat for 5-10 minutes. Strain liquid from solids. Return to pot and add 1 packet of gelatin. 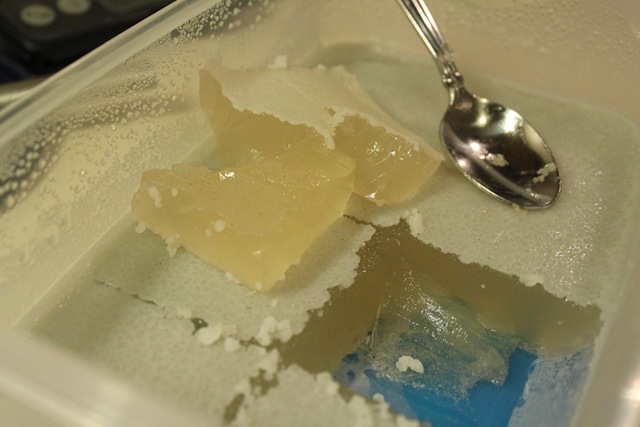 (If you used pig skin, then the gelatin likely isn’t needed and liquid can directly go to refrigerator to set.) Heat and stir until dissolved (~3 minutes). Transfer liquid to a container and put into the refrigerator to set. Mix all ingredients. *** Chill until needed. In a large bowl (stainless works best for me), mix flour and water at first with spoon until combined. Leaving the dough in the bowl, once mixed, use hands to knead until a ball (that’s not overly sticky) has formed. I often have to add a little flour or water to get the right not-to-sticky texture. I guess the correct texture could be described as tacky. Cover bowl (I use a dinner plate) and let sit for 10 minutes. Then, knead for 10 minutes. After soup has set, it should literally look like clear meat soup Jello (gross, I know. But this is a very accurate description). Run a butterknife or fork through the soup Jello to break into small pieces. Don’t worry. You don’t need equally-sized pieces. Take one piece of dough and flatten it into a disc. 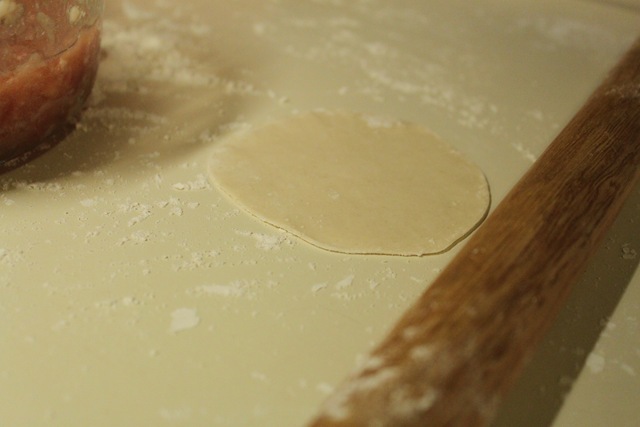 Use rolling pin (a Chinese-style one works best) to roll almost as thinly as possible. If I had to guess the diameter, I would say the dough ends up being roughly 3 inches in diameter. Place wrapper into hand (since I’m right-handed, I place the wrapper in my left hand) and fill with about 1 T of meat filling****. Poke a little hole in the center of the meat mound and add a cube or two (depending on size) of the soup Jello. Then comes the pleating. This takes practice. The easiest thing to do is to start by squeezing a pleat into the wrapper to get started and then just continue pleating around the dumpling until you run out of dough. Then, twist and squeeze shut. I found it helpful to watch videos on YouTube. This blog also had a useful slideshow of the pleating process. 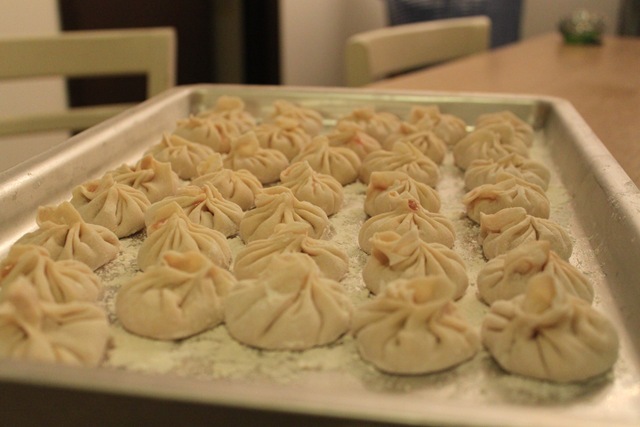 Let xiao long bao rest for 10 minutes before cooking. You can cook immediately or freeze them for later. The best way to freeze them is to cover a cookie sheet or jelly roll pan with flour. Then, place xiao long bao on the pan. Freeze overnight or until hardened. Then they can be transferred to a plastic bag or storage container. 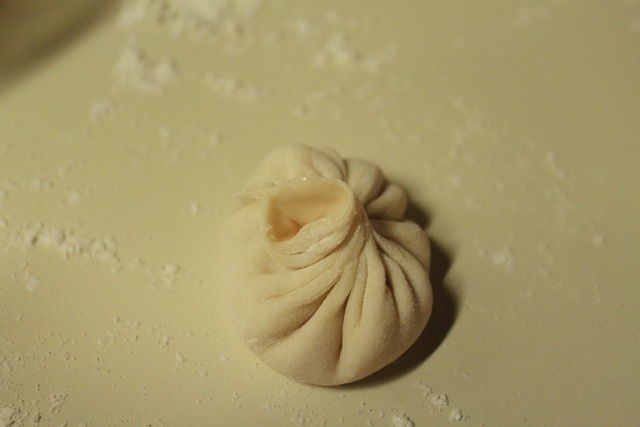 Doing the freezing in two steps prevents the dumplings from sticking together. You can use a bamboo steamer or a metal pan with steamer insert. I place a sheet of paper towel in the bottom of the steamer and put as many xiao long bao as can comfortably fit without touching (~8 for my sized pan). Steam for 8 –9 minutes. This recipe is probably best done over two days: day 1 make soup and day 2 make filling and skin and wrap. *My roommate from China says that it’s best to buy pork and hand cut it until it is finely minced like ground pork rather than buying meat that has already been ground at the grocery store. I’m not convinced it matters, but she is the better cook of the two of us. **Next time, I think I’ll use less ginger-onion water since adding it to my filling made it extra soupy OR I’ll put the filling in the freezer for 30 minutes or so before wrapping so it can harden up a bit—making it easier to fill the wraps. ***My roommate says it is best to stir the filling only in 1 direction. Again, I’m not convinced that it matters. But she says this is common practice with ground meats/fillings in China. ****It takes a lot of practice to get the amount of filling just right. You don’t want to put too little, but if you put too much, the filling will leak out and defeat the point of containing the soup. *****There are many recipes for the dipping sauce, but I like to keep things simple.